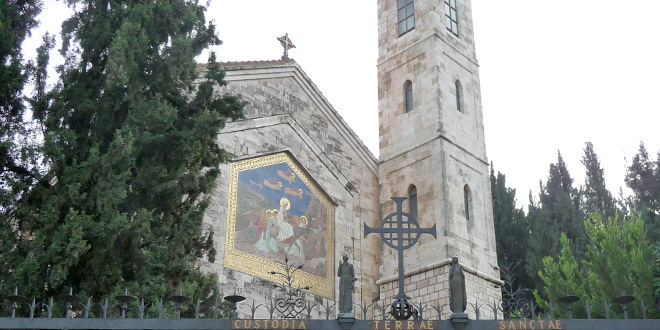 Holy place: The Church of the Visitation in Ein Karem. THIRTY-one pilgrims, including Rockhampton Bishop Michael McCarthy, found themselves humbled and spiritually reawakened walking the roads Jesus walked. Fr Noel Milner, who has worked with parishes from Brisbane to Blackall, led the group with Bishop McCarthy to the Holy Land. “It is always a great spiritual privilege to go on pilgrimage – to walk where Jesus walked, as they say,” Fr Milner said. In early December, the group of 31 pilgrims, set off from Brisbane to Israel, setting a break-neck pace after touching down at Tel Aviv airport. The first site to visit was Old Jaffa, where St Peter had his vision to open the Good News to all people, which resulted in the conversion of the Centurion Cornelius. “The following days were filled with Masses each day in very special places as regards the life of Jesus, and visits to biblical sites,” Fr Milner said. “(We went to) very special places like Ein Karem, the home of John the Baptist and the site of the Visitation of Mary to her cousin Elizabeth. The pilgrims visited other biblical sites like Caesarea and Megiddo on the way to Galilee. In Galilee, the pilgrims went to sites like Capernaum, Magdala, Tabgha, the place of the loaves and the fishes, and Mount Tabor, the place of the Transfiguration. Another lesser-known site the pilgrims visited was Sepphoris. “Sepphoris is a place not always on the pilgrims’ map,” Fr Milner said. Seeing these “very human” places of Jesus’ life was a feature of the pilgrimage. Fr Milner said unrest in certain areas meant the group couldn’t visit Jacob’s Well or Shiloh, and so the pilgrims went straight to Jericho, the oldest city in the world and where Jesus was tempted at the beginning of his ministry. “The visit to the Dead Sea and Masada is always a must when in the Holy Land,” he said. This was the focal point of the whole journey. “The highlight was when we followed the Way of the Cross through the darkened streets of Jerusalem in the early morning, ending at the Church of the Holy Sepulchre,” Fr Milner said. “We were able to visit the site of Calvary and touch the actual stone where the cross was placed, then given the rare privilege of celebrating Mass in the Tomb of Christ. Unfortunately Bishop McCarthy was unwell, so Fr Milner and Fr Bill Senn concelebrated the Mass using the actual burial site of Christ as the altar. Centacare Central Queensland director Robert Sims was also on the trip. Mr Sims said travelling around the Holy Land and visiting the various towns and sites provided a real perspective and a new level of understanding on the Gospel stories. “A particularly special moment on the final day of the pilgrimage was walking the old City walls of Jerusalem with a couple of fellow pilgrims looking out over the sites we had been visiting over the last few days in and out of Jerusalem and remembering the stories, traditions and history shared by our guide,” he said.